PT. MRT Jakarta is about to provide 16 business places in five MRT stations for Small, Micro, and Medium Enterprises (UMKM)s. They should pass the selection process to get the place. According to plan, the result to be announced on February 8, 2019.
" This is our commitment to give a chance for UMKMs to develop"
PT. 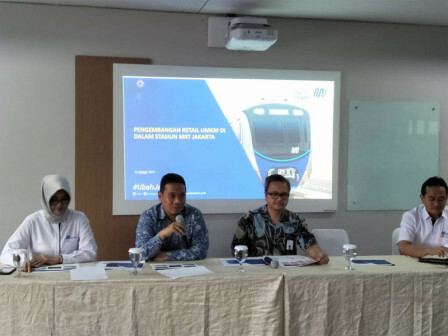 MRT Jakarta Development and Business Support Director, Ghamal Peris explained, six UMKMs to be placed in Lebak Bulus Station, one UMKM in Haji Nawi Station, six UMKMs in Fatmawati Station, one UMKM in Blok A Station, and two UMKM in Dukuh Atas Station. "Total 16 UMKMs in five MRT stations. This is our commitment to give a chance for UMKMs to develop," he said, Thursday (1/24). Those UMKMs are divided into three categories: culinary, fashion, and handicraft. Eight business places for culinary, five for fashion, and three for handicraft. In the selection process, UMKMs should fulfill all the requirements: the owner should be Indonesian, the business is not a franchised business, and the owner shouldn't have a store in shopping center category A.
UMKMs should also show their financial report from brand that has been operated for the last one year, and able to operate the shop from Monday to Sunday 05.00-22.00. "You can get more information regarding the requirements in MRT Jakarta website," he added. His side provided business place as wide as eight meters for each locations, without any service charge, and using profit sharing system. "Those who have passed the selection, need to pay Rp 1,360,000 per month for the rent," he informed.